Rather than doing the traditional fish-only style setup with these large tanks, we worked with National Geographic to produce a thriving 2,000 gallon reef aquarium, full of live fish and corals, at the Kimberly Hotel in New York City. This project is featured on the show Fish Tank Kings. One of the biggest challenges for this project was the installation of live rock. The unique shape of this aquarium required us to develop a stable structure to support the live rock and corals, so we built a frame out of PVC to outline the aquascape of the aquarium. We then constructed pillars of live rock by drilling through each rock and stacking with a support of pipe through the center of each rock. Although this was extremely time consuming, the end result is fantastic. The fish behavior in this large reef aquarium is dramatically different from that of those in smaller aquariums. With large groups of fish of the same species, schooling behavior and community behavior is observed among the various reef fish such as anthias, yellow tangs, purple tangs, and bangai cardinal fish. 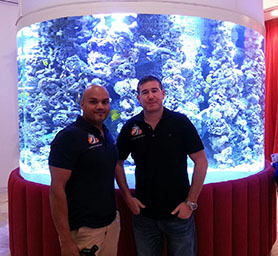 With the proper set up by The Complete Aquarium, as well as our service plan, the Kimberly Hotel's aquarium continues to flourish and will be a dramatic source of coral reef awareness for those who visit. Large aquariums such as this help The Complete Aquarium follow its overall goal as a company: to spread awareness of these beautiful coral reef ecosystems and provide them with the environmental protection they deserve.